Man, I had forgotten about the fact that everyone had shag haircuts and those clothes. At least there were no leisure suits in those pictures. But hey, that is Bill Butler in that last picture posted on May 28th. Now I can try to forget that decade again. I wish whoever did that blog could open their scope to earlier stuff, though. They obviously know how to find interesting stuff thats not elsewhere on the internet! Sadly, I have not enough time to show my vaults. 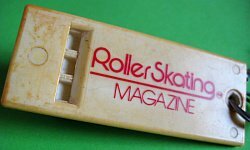 Documents, stuff, collectables of roller skating from the early 60s to the late 80s. 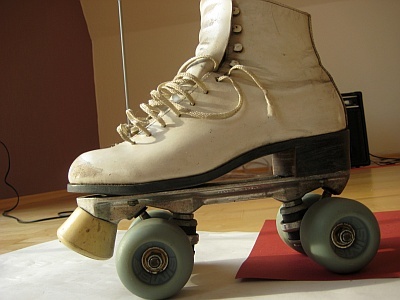 I worked in the 80s in skate shops and especially grabbed all flyers and marketing-material I came across. Riedell 120, Sure-Grip Super X (old style) SIMS 63s (incl. original slotted spacers - for the experts... ;-)) and SIMS Gold Bearing. 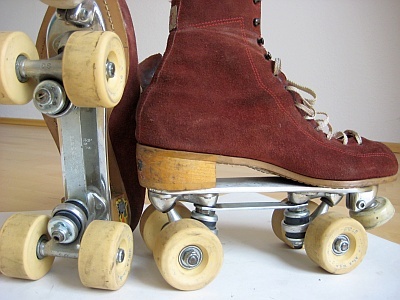 from 1981: Norelé red suede boot, Sure-Grip Century plate, Rollerbones 95A wheels, SKF Italy Bearings. And you're right Lita Malibu sure has uncovered some good vintage material. The Radium Rays (stunt skate couple)! Swabbies rolling on the battleship deck. A wedding on skates from what looks to be the 1930s. And thanks, JBDeutschelander for the look at some of the vintage collectibles. Any time you get the chance to post more, it would be appreciated! It's nice to see the history. 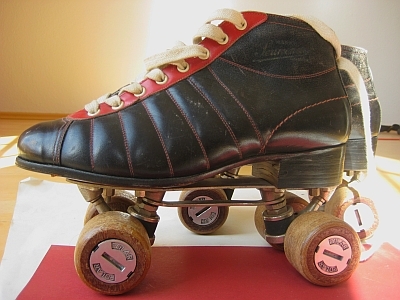 JB, I was going to comment on those hubs and wheels on the late 60s vintage speed skates. Looks like vanathane wheels or something like that, and those hubs are pretty incredible: looks like they're designed to both lock the wheels in tight and yet let them spin fast. I just love stuff like this! Hmm...tried to view the wheels a couple of times (the message said either temporarily unavailable or expired or I am not authorized to access), but couldn't get to the page. (I'm not a member of facebook). Thanks for the link HK some very nice long forgotten memories have been rehashed. Nice link! JB No Way you have all those vintage wheel? Very Nice Collection.I'm curious did you collect them all while living in Germany?